So much has happened at No. 77 in the last ten days I hardly know where to start this update! How about we go section by section? MAN, this wallpaper has consumed my week. 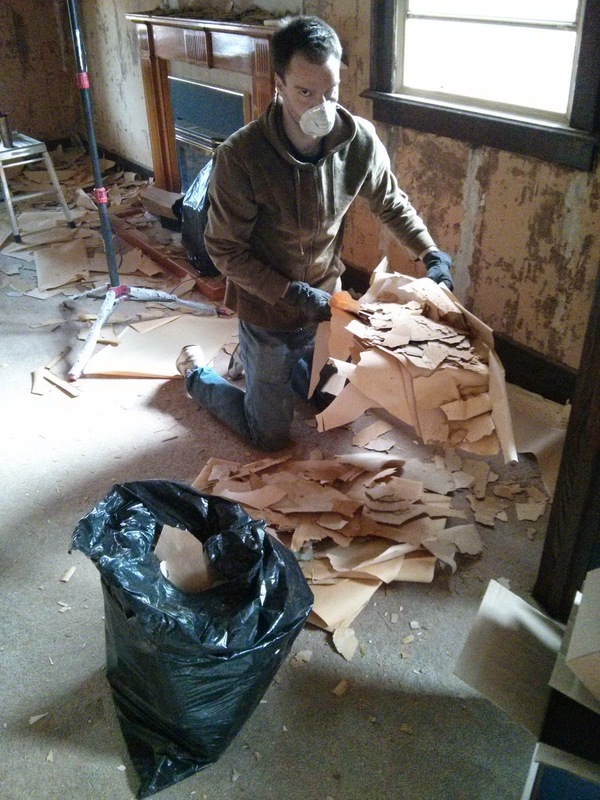 But let me tell you, I now know about 37 different techniques for removing wallpaper, and I did manage to land on a few that really worked. The biggest accomplishment is that it’s ALL GONE from the living room, master bedroom, and the office. 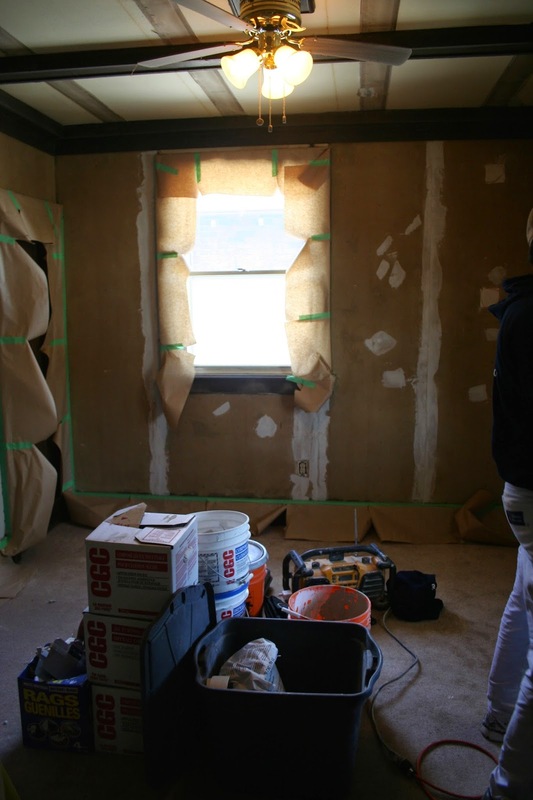 And, the trim is all paper-taped and ready for our contractors to come in and mud the seams to make the walls super smooth and ready to paint. I used a wallpaper steamer to strip most of the wallpaper in the master bedroom, since the bottom two layers were SUPER stubborn and I could not coax it off in any other way. Steaming wallpaper is boring, hot, smelly, tedious work. But steaming was effective and I’m glad I finally got it all done. Jordan removing the wallpaper debris. Gross stuff. Then I had to move on to sanding the walls. Stripping wallpaper off cement board leaves little nubs and chads on the surface of the paper, all of which needed to be removed. And, in the living room, I the bottom-most layer of wallpaper was so brittle it wasn’t in an intact enough layer for even the steamer to take it off, so that ended up needing to be sanded off as well. Please note my pants are BLACK. Have you met me? Do you know what colour my hair ACTUALLY is? All that was left was to vacuum up the centimetre of orange pulverized-wallpaper dust out of each room, and turn it from a weird moonscape into a house again. 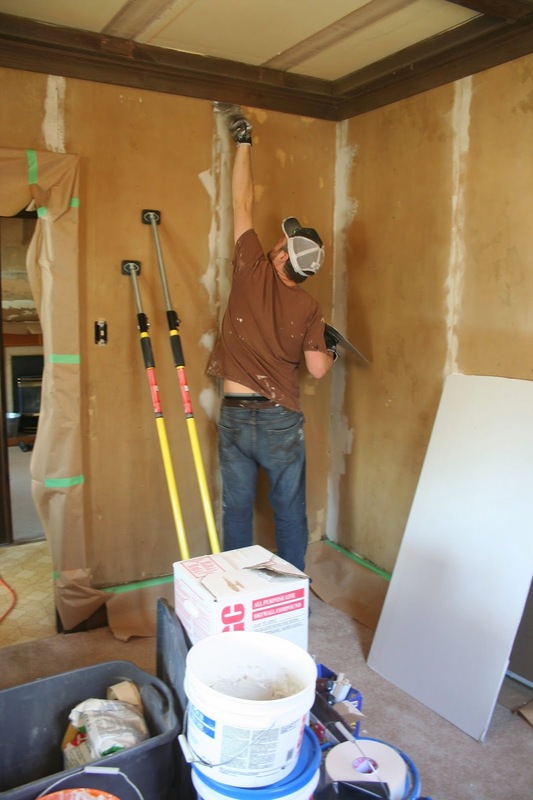 After stripping and sanding all of the walls, I wasn’t about to pull a Michelangelo and do the same process on our ceilings… which are made of the same cement board and covered in three layers of wallpaper. It’s just NOT going to happen. So, Jordan and I decided to remove some of the beams on the ceilings, to lighten up the look by making the ceilings less dark and oppressive. We’ve retained the main beams in the office, master bedroom, and the living room. Master bedroom ceiling, remaining beams. Living room ceiling, with a couple missing beams on the right that will go back up. However, we removed all of the beams in the dining room, because we took out the kitchen wall and want the dining room and kitchen to flow into each other. Jordan putting in electrical boxes for our kitchen lighting. We’ve asked our contractors to put up drywall on the ceilings. It will just cover the ceilings and give us a smooth, new surface that will be totally paintable. Also it will fit snugly in between each wooden beam, and we’ll just finish the edges with some quarter-round trim. Remember that PIPE we discovered when we took out our kitchen wall? Turns out it was just a vent pipe for steam from the bathtub drain. Jordan and Jim were able to remove the original cast-iron pipe (who makes pipes out of CAST IRON anymore!?) and replace it with a PVC pipe, but moved it into the corner of the wall. Jordan and Jim have also spent a ton of time this week working on the electrical outlets in the kitchen, moving the switches and plugs from the removed wall to places where we need and will use power in our new kitchen. And probably a bunch more that I can’t remember right now! 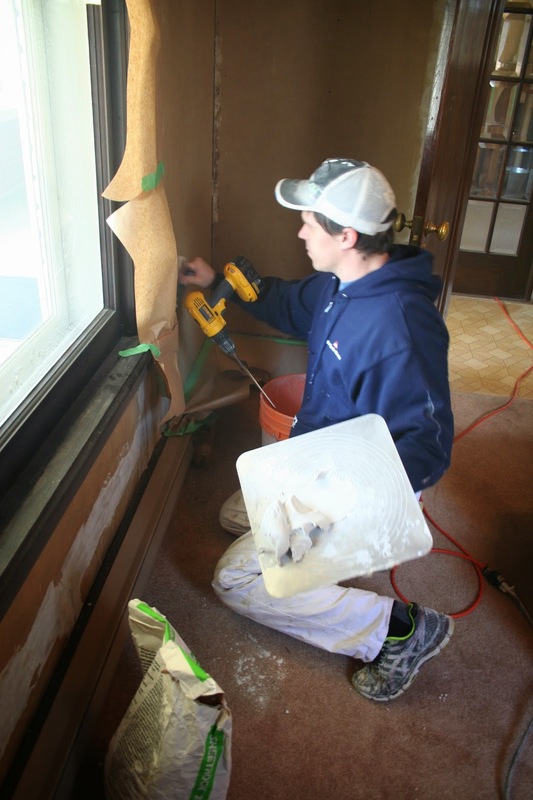 After removing all the wallpaper debris, sanding, vacuuming, and paper taping all our millwork (baseboards, and trim on windows and doors), we were ready for Jay and Eric to come in and work their magic. They set up shop yesterday, and went straight to work patching up all those cement board seams, as well as smoothing out rough patches and nicks in the wall. Once they’re done, we’ll be able to PAINT THE HOUSE. I think I’m gonna cry when I roll that first coat on. It’s been a PROCESS to get to this point. 77 boxes of IKEA kitchen cabinets got delivered to our No. 77 house yesterday. How perfect is that? My bestie Charlotte came over for a few hours in the afternoon, and we catalogued and organized every single box (not a single one missing!). Then, we built four of our 12 total cabinets for the kitchen. With bright pink hammers and screwdrivers. The goal is to install it early next week! I can’t believe how much we’ve gotten done so far. We are nowhere near the end, folks, don’t get me wrong. But seriously. We are pretty much on schedule. And we have had So. Much. Help. from so many friends! I wish I could introduce them all here, and tell you all the big and little things they’ve done to help us out, from bringing coffee to holding the shop vac while I sanded the living room, cutting through 100-year-old cast iron pipe, from pulling out bushes in the backyard to itemizing IKEA cabinets. A friend recently posted on Facebook, “People who don’t accept help are rarely reached out to for help.” Or, put another way: If you ask your friends for help, they will ask you for help. So many people have already come in and out of our house in the last two weeks. We’ve already spent hours drinking coffee, eating lunch, and taking snack breaks on our amazing front porch. We have asked everyone we know in London for help, or to borrow their tools. We are asking for a lot of favours now and running up huge relational “debts.” Jordan and I are going to be returning these favours for years. But honestly? We wouldn’t want it any other way. Life is meant for relationships and community, and nothing forges friendship faster than sharing hard work and accomplishing something concrete. So when you are next tackling your big life project, call us up. We’ve got our work clothes ready.